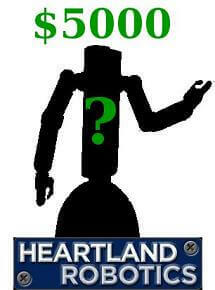 Heartland Robotics To Make A $5000 Industrial Robot? Rodney Brooks could be aiming low. Rodney Brooks is making news by keeping his mouth shut. After leaving iRobot (so long, Roomba! ), and retiring from MIT, one of the most famous names in robotics has been silently building his new company, Heartland Robotics. Silent being the key word here. Besides regular updates on the millions of dollars he’s raised, Brooks isn’t sharing any details about the first (unnamed) robot the startup will produce. Heartland’s website makes bold claims for their mystery bot, saying it “will change the definition of how and where robots can be used, dramatically expanding the robot marketplace.” But what will it be? Scott Kirsner at The Boston Globe spoke with some of the select few that had been invited to Heartland’s Cambridge office and had seen the unnamed bot demonstrated. The consensus is that Brooks is building a robot with two arms that can be trained to perform a task simply by moving it physically. And it will cost around $5000. Pretty incredible. At that price point a completely new echelon of companies could afford to augment and replace workers with robots. Visitors to Heartland describe a robot that looks like a human from the waist up, with a torso; either one or two arms with grippers; and a camera where you might expect the head to be. The robot is on a rolling base rather than legs; it can be moved around but doesn’t move autonomously. The arm and gripper can be quickly trained to do a repetitive task just by moving them, no software code required. And I’m told the robot has a sense for when people get close, so it doesn’t pose a safety hazard to humans working alongside it. The company is apparently targeting a $5,000 price point. The Obrero Robot, developed by Rodney Brooks and Eduardo Torres-Jara at MIT, is still my favorite contender for what Heartland Robotics' unnamed bot will be based upon. Most of this jives with what we’ve been expecting from Heartland Robotics. 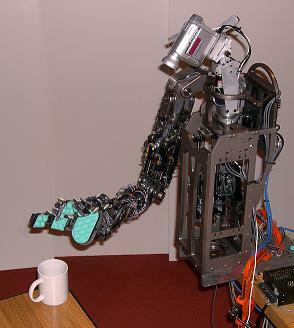 The last big project Brooks seemed to be associated with at MIT was a compliant robotic hand that could pick up delicate objects quickly and easily. (The robot described above sounds almost exactly like “Obrero“, the robot from the MIT project.) Heartland’s website has also stated that one of their goals is “making manufacturers more efficient, their workers more productive and keeping jobs from migrating to low-cost regions.” A $5000 robot that can perform manual tasks would definitely give manufacturers an alternative to shipping jobs overseas. The fact that you can “program” the bot simply by moving it through a task would allow it to be used by people with little to no technical background. If this really is what Heartland is working on, it seems custom fit to automate an untapped sector of manufacturing. I should point out that nothing described in Kirsner’s article is outside our current levels of technology. Robots taught through manipulation have been around for a while, and we reviewed a fairly sophisticated example more than a year ago. As we said, Brooks already has experience with compliant arms and hands. Sufficient computer vision packets are available via open source libraries like OpenCV. All the pieces seem to be in place. The real story is that Brooks and Heartland may be assembling those pieces into a robot that can be produced on a mass scale and on the cheap. $5000 is an amazing price point. Not cheap enough for home use, probably, but still very accessible to small businesses. Hopefully Brooks and Heartland robotics will break their silence soon and give us a look at what they’ve been developing behind closed doors. It doesn’t have to look cool, Rodney, just show us that it works. That will be exciting enough, I assure you.